Email from Client who purchased an aircraft he had never seen, until after he owned it. I could never imagine myself buying an airplane in a foreign country, without ever seeing it, either the person who was selling it to me, but that ended up happening and the result is, that the airplane was exactly what was pictured on your website, photos and description. For sure, I would buy another airplane from you under the same circumstances and also would recommend you to any friend of mine. It was a pleasure dealing with you and I hope we can do some more business. feel that the plane and myself are becoming friends. Two very happy customers with 2 great aircraft! I want to thank you for all your help with the recent purchase of our MU-2 Marquise. At your recommendation, we purchased our current aircraft after looking at several others. I now have over 125 hours of trouble free operation with the aircraft. It has been to IJC in Tulsa two separate times for required inspections. You told us this aircraft had an excellent maintenance history. The results of the inspections at IJC certainly agree with your representation. Thank you for not leading us astray! As you are aware, I intended to sell my previous airplane without the help of a broker when I purchased the MU-2. I was so impressed with your integrity and honesty, that I listed and sold that plane with you. Your expertise benefited me when the buyer took us through the ringer on the pre-buy inspection. Thanks again for taking care of that tough situation and not letting the buyer take advantage of us. You earned your fee on that one! Ron, please feel free to have any potential customers call me directly. I welcome the opportunity to discuss the wonderful experience that you created on these two transactions. As far as I am concerned, there is only one person I would contact in the MU-2 market- Ron Northern. Once in while you meet someone in whom you think you can trust. Rarely do you find someone who doesn’t betray that trust. It is not a question of judgment, but one of culture. Today the business world is focused on profitability and performance not honesty and integrity. Spin is the name of the game. I really am not the world’s greatest cynic, just tired of having to take so many grains of salt with my business dealings. Not to say all used aircraft Dealers and Brokers are dishonest by default, but my experience has taught me to beware. Reality says that your average aircraft reseller expects to do continuing business with the sellers (banks and other dealers) not you the buyer. The words ‘caveat emptor’ perfectly described the aircraft purchase process. Setting the above aside, I want to tell anyone who’ll listen that Ron Northern, of Northern Aircraft Sales is truly a unique personality. He is truthful to a fault; fairly representing the aircraft and you as a potential buyer or seller. His honesty is very narrow wire to walk; he does it superbly! He is there at any time to help and advise about the process, the timing and the detail of a transaction that is anything but simple and intuitive. I have sold an aircraft thru him, and I bought another through him; not my first sale or purchase of an airplane. In each case the detail that I as a principal had often ignored in the past was properly served. Complete professionalism is Ron’s standard and he maintains it without apparent strain. In the process of using his professional services I now realize that I had made a new friend. A very nice dividend to the business we did together. To anyone in the market (buyer or seller) I recommend, without reservation, you contact Ron Northern. He will be a helpful resource and you will profit from the association whether you buy or sell through him (this time) or not. Just wanted to let you know Derrich and I love the 210 and it was great doing business with you !!! We will surely give you a call when we are ready to move up. If you wouldn’t mind, I would love to know what the Guy’s who washed the plane used on the spinner ? It really cleaned it up and I would like to keep it that way if possible. We contacted Mr. Watts and are buying everything he had left and told him we would be happy to drop by and let him fly 62M when we are in the area. I want to thank you for your help on my recent aircraft transactions. 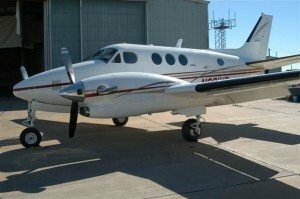 It was quite a surprise when in only 45 days you had sold my Cessna 340. Caught un-prepared for such a quick sale, you provided another pleasant surprise when you found my current C90 King Air so quickly. I would have never known this aircraft was available since it was not officially “on the market” or being advertised. Before retaining you as my acquisition agent I had spent hours on the internet and talking to brokers about King Airs. After getting the run around, being shown aircraft that weren’t what they were represented to be, and being “snubbed” it was refreshing to work with you. You showed me aircraft that were not officially on the market, and “culled” all the ones that did not meet my standards, saving me many hours. Thanks again for all that you have done to help me get that Duke. If you every need a reference please use me, I would be honored to recommend you to handle the sale or purchase of anyone’s aircraft.